Is an Epoxy System Right for Your Project? If you are considering a boat repair or building project, your first decision concerns whether epoxy is the best product for your application, or if you should instead consider a polyester or vinylester resin, gelcoat repair product or an adhesive sealant like 3M’s 5200 polyurethane caulk. WEST System Epoxy combined with additives can be used for filling and fairing holes and voids. Epoxy resin, used in conjunction with its companion hardeners, fillers, fabrics and tools, is one of the most versatile materials available for boat repair and construction. Epoxy-based systems owe their broad acceptance, by pros and amateurs alike, to the fact that they allow you to tackle such a wide variety of projects. Whether you want to repair gelcoat cracks or a delaminating deck, install a bulkhead or even cold-mold a brand-new hull, you can create an epoxy mixture with the precise characteristics you need. 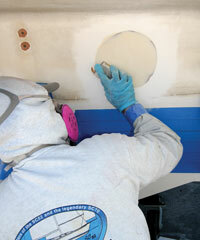 We’ve found that using epoxy products has added a whole new dimension to our boat repair skills. We feel empowered to take on projects that we would have formerly delegated to a boatyard or boat maintenance worker. Epoxy systems have many additional applications at home when it comes to reinforcing furniture, patching surfaces and other repairs. Coating, where you apply one or more thin coats of epoxy to seal a surface or to prepare the surface for varnish or reinforcing layers like fiberglass or carbon fiber. Bonding, where you use the epoxy as a glue, generally with some filler to allow it to fill gaps between the surfaces, or to attach hardware to a surface. Laminating, where multiple layers of wood or other materials are laid up to create a thicker solid structure. Fairing, where thickened resin is used to fill holes and depressions so that the surface can be sanded and smoothed. Note that while many applications involve wood, epoxy resin can be used on fiberglass, carbon fiber and metals. Which Epoxy System Should You Choose? West System products has been around for over four decades, and the manufacturer provides some of the clearest technical info anywhere. We carry almost their entire product line in our stores, and many of our associates have lots of experience using West System products. Take your pick between West System and the Interlux Epiglass epoxy products. 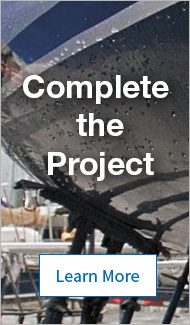 Used correctly, either will deliver great results as a boatbuilding and repair material. For this West Advisor, however, we’re going to discuss the readily-available West System. We’ll also note that West System and West Marine have no connection besides the fact that we, West Marine and our Associates, use and market West System products (WEST stands for Wood Epoxy Saturation Technique, a wood-epoxy composite boat building method used by company founders Meade and Jan Gougeon). Start with 105 Resin, the basic ingredient of all West System epoxy compounds. The clear amber resin cures to a high-strength plastic solid at room temperatures when mixed with specific proportions of the correct hardener. Use 300 Mini Pumps for convenient and accurate metering. When using these pumps, remember that the proper mixture is achieved when you mix one full pump of resin with one full pump of hardener. Mix with one of four West System hardeners. Select a hardener for its intended use and for the cure speed best suited for your job in the temperature range in which you are working. To make it easier to buy, the right amount of resin and hardeners are packaged in Group Sizes. For each container size of resin, there is a corresponding container size of hardener like West System Group A or Group B. Add one of six West System fillers to thicken the mixture as needed. Select a filler for its handling characteristics or cured physical properties. Or, add one of four WEST System additives to provide specific coating properties. Fillers are designed to thicken the epoxy mixture and are broadly grouped into two categories: high density and low density. Low Density fairing fillers cure to a light, easily-sanded material which is often used for cosmetic or surface filling applications such as shaping or fairing. Examples include West System’s 410 and 407. High Density adhesive fillers are used to modify the structural properties of the epoxy by adding strength, bulk or both. They include West System’s 403, 404, 405 and 406. High density filler mixtures cure to a strong, hard-to-sand plastic useful in structural applications like bonding, filleting and laminating. Mix the desired quantity of resin and hardener thoroughly before adding fillers. Begin with a small batch—allow room for the filler. Additives alter the physical properties when the epoxy mixture is used in coating applications. 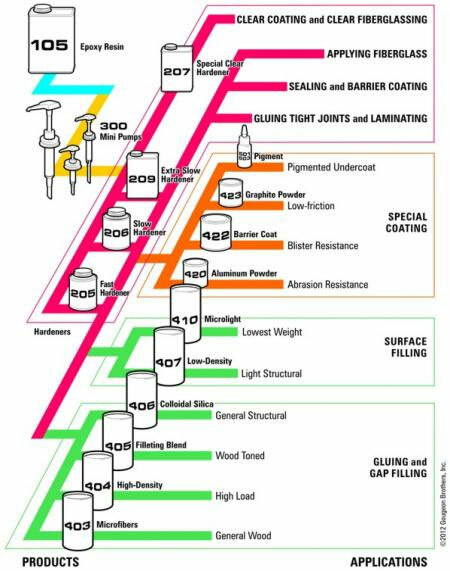 Barrier coat additive (422) improves the effectiveness of the basic epoxy/hardener mixture at resisting moisture penetration. Adding graphite powder (423) makes coated surfaces slick, which can be used on rudders, centerboards or centerboard trunks. White pigment (501) and gray pigment (503) can add color to the epoxy mixture, useful when 105 epoxy is applied as a base for painting. Unlike additives and fillers, reinforcing materials (like fiberglass or carbon fiber cloth) are not mixed with the epoxy, but are often used in conjunction with the epoxy mixture to provide additional physical properties. 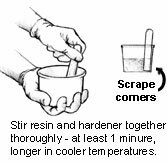 Mixing epoxy resin and hardener begins a chemical reaction that transforms the combined liquid ingredients to a solid. The time it takes for this transformation is the cure time. 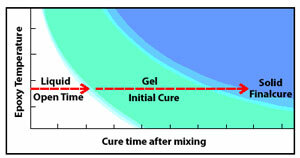 As it cures, the epoxy passes from the liquid state, through a gel state, before it reaches a solid state. Liquid—Open time: Also known as working time or wet lay-up time, is the portion of the cure time, after mixing, that the resin/hardener mixture remains a liquid and is workable and suitable for application. All assembly and clamping should take place during the open time to assure a dependable bond. Gel—Initial cure: The mixture passes into an initial cure phase (also called the green stage) when it begins to gel or “kick-off.” The epoxy is no longer workable and will progress from a tacky, gel consistency to the firmness of hard rubber, which you will be dent with your thumbnail. Because the mixture is only partially cured, a new application of epoxy will still chemically link with it, so the surface may still be bonded to or recoated without special preparation. However, this ability diminishes as the mixture approaches final cure. Solid—Final cure: the epoxy mixture has cured to a solid state and can be dry sanded and shaped. You should not be able to dent it with your thumbnail. At this point the epoxy has reached about 90 percent of its ultimate strength, so clamps can be removed. It will continue to cure over the next several days at room temperature. Personal safety: Always wear disposable gloves and wear eye protection if any splashing might occur. Avoid breathing vapors. Use epoxy only in areas with good ventilation. Wear a respirator with an organic vapor cartridge. Wear a dust mask when you sand the epoxy. If it has cured for less than a week, use a respirator with the organic vapor in combination with a dust pre-filter. Epoxy may cause irritation of your skin, especially fair skin. Avoid all direct skin contact with resin, hardeners and mixed epoxy by wearing gloves and other clothing. If you get any epoxy on your skin, clean it off immediately after contact with waterless soap, then wash thoroughly with soap and water. NEVER use solvents to remove epoxy from the skin. Tools can be washed with white vinegar or isopropyl alcohol. Semi-gelled “green” epoxy can be removed with acetone. Avoid ingestion, and wash thoroughly after each use and especially before eating or drinking. Workshop safety: Clean up spills with a squeegee and paper towels. Scrape up as much material as possible with the squeegee before using the paper towels. Sand, clay or other materials may be used to contain or soak up a spill. Clean residue with white vinegar or isopropyl alcohol. Always wear protective gloves when cleaning up spills or at the end of a job. Dispose of resin, hardener and empty containers safely. Do not dispose of resin or hardener in a liquid state. Before disposing of resin and hardener containers, puncture the corners of can and drain residue into clean containers for re-use. Small quantities of resin and hardener can be mixed and cured completely to a non-hazardous solid. Epoxy is exothermic; it gets hot as it cures. Place pots of curing resin and hardeners outside on the ground to avoid the danger of excessive heat and vapors. Dispose of after the reaction is complete and the mass has cooled. Then follow your local state and federal regulations for proper disposal. EZ-Tex Marine Epoxy Repair Compound, 4 oz. EZ-Tex Marine Epoxy Repair Compound, 16 oz. G/5 Five-Minute Epoxy Adhesive Kit, 32 fl oz. G/5 Five-Minute Epoxy Adhesive Kit, 8 fl oz.